One slice of toast from a loaf baked from Pamela’s GF Bread Mix, cut in half and filled with American Grilled Cheez (the latter made using quinoa flakes rather than quick oats ((I have an allergic reaction to oats. It’s not as severe as to wheat/gluten, but it’s not pleasant either.)) ). There are also Hickory Bits in there, which are somehow as addicting as bacon bits. Respectively: 170 cals, 72 cals, and 23 cals. Or suchlike. There’s also half a boiled egg…. … along with its other half in the upper container, for 78 calories. There’s half an apple in there (think it’s a Fuji) for 31 calories. I think I’m going to keep fruit in their own side, snack bentos from now on, though. They tend not to mix well with main dishes, unless the main dish happens to be a fruit salad. 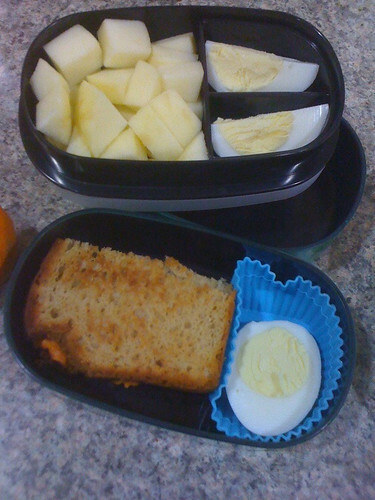 There’s an unseen bento box here that had almond nut thin crackers (11 for 89 calories) and approx 2 tablespoons of Colby Cheez in cube form (32 calories). Everything added up: 494 calories.